Camping La Grappe d'Or är en camping i Meursault, Côte-d’Or. Denna terrasscamping och camping med sluttande terräng har platser med stängsel, med skugga, utan skugga och platser med lite skugga. På campingen finns en lekplats. Att laga sin egen mat är inte alltid nödvändigt, för på campingen finns en snackbar. På campingen kan du också köpa färskt bröd. Det är möjligt att komma ut på internet, därför att campingen förfogar över en eller flera datorer med internetförbindelse och på 80% av campingarna kan man komma ut på internet med egen laptop. Denna inspektör gör varje år ett besök på Camping La Grappe d'Or och inspekterar campingen för ca 200 faciliteter och för andra förekommande punkter. Inspektören är en medarbetare från ACSI och arbetar inte för campingen. This is very pleasant site in a very rural location. Pick the right pitch and the views of the vineyards are amazing, especially as we watched the grape harvest. We were also here in July with our grandchildren. Some power points can be a bit far, but if that’s the case reception have extensions at no charge. Toilets are clean, but the lower block was closed at our Sep visit - avoid staying in the lower pitches if you have issues walking. One bug, after coming for a few years is that since Huttopia took over this year, the wonderful restaurant facility available from Jun-Sep has gone. Now nothing except Jul-Aug when it’s a snack-bar ... disappointing. Huttopia have projects for 2019, so we’ll be back to see. One item they could change is the appalling WiFi charges and really poor signal strength for that price. Still we’ll see in 2019 ... staff friendliness and helpfulness unchanged though - wonderful. Very disappointing this year, new ownership, restaurant closed, pool closed, staff did not seem interested. One night stay and site pretty muddy, but I do not think we saw it at its best. Views are lovely, vineyards as far as they eye can see. Restaurant pretty good and prices ok. Walked into village but was pretty dead. Would struggle to stay more than a couple of nights as very little to do. Would use again for an overnight stop as convenient from motorway. Staff friendly. Lovely English speaking staff in reception, so helpful and friendly. The campsite is terraced overlooking the vineyards and beyond so super views but the pitches are cramped and soon get muddy. The facilities are spotless with good hot showers but the shower cubicles are the smallest we have ever used and we have travelled a lot! A bigger person would really struggle to get in! A busy site even in Sept with lots of over nighters. This is a lovely campsite overlooking the vineyards of Meursault and a ten minute walk from the really pretty town which in itself is worth a visit, especially if you like having a look round chateaux and wine cellars. Some of the pitches with what were supposed to be the best views did seem very crowded and so we chose a pitch further back which still had a wonderful view out of our back window but was much more spacious (if you're interested it was Pitch B14). We ate in the restaurant one night which was OK and included 2 free glasses of wine. There is a good dog walk from the site around the vineyards. Please note that they do accept payment by credit card either on the site or in the restaurant for bills under €40. Excellent campsite in the middle of the vines. Friendly, knowledgeable, helpful staff. Level pitched with views over the vines. Access from the campsite to a number of cycle routes , including one through the vines to Beaune (the only way to get there as parking could be a nightmare). We arrived at the beginning of the season but the facilities that were open were top quality. Heater in the shower block was very welcome! Would return if in the area again. Walking distance of some nice eateries in Meursault itself. Easter wine festival in next village was a bonus. Previous reviews say it all, this is a lovely site a 10 minute walk from the village of Meursault which in it's self is very pretty. Facilities on site are modern, spotlessly clean with a constant supply of hot water - restaurant on site but we didn't use it so can't comment. The site is terraced with the prime pitches overlooking the vineyards but these are very close together we had a larger pitch by going right to the top of the site - less view but more space. Be aware that we stayed there during the first week in September and the site was full by approx. 4 pm each day. I would use this site again. We have stayed at La Grappe D'Or on several occasions now and it is one of our favourite campsites! It is beautifully maintained and the toilets etc. are immaculate. The village/town of Mersault is lovely, a great base to explore the area. The campsite is fairly small with great facilities for its size. We have fairly young children (9 and 7) and the campsite is perfect for them; plenty for them to do but small and friendly enough for them to be a little bit independent. The staff are excellent - very friendly and helpful. We will definitely return! Beautiful site with lovely views of the Burgandy vineyards from the terraced pitches. Friendly staff who speak English. Good restaurant with view over vineyard. Good clean facilities, the best site we have been to. Meursault village within walking distance. At the junction of D974 and D23 there is a good en vrac wine wholesaler (fill your own containers) Good cycling to Beaune. Vill du boka campingen Camping La Grappe d'Or eller få mera information? Det går bra med nedanstående uppgifter eller via campingens webbsida. 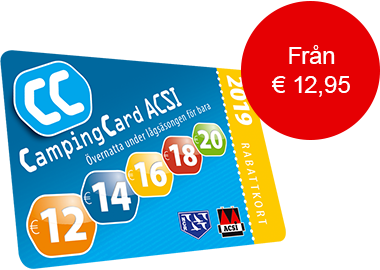 ACSI Eurocampings skickar din informationsförfrågan till "Camping La Grappe d'Or".